We have been eating so much kale lately. At least once a day. 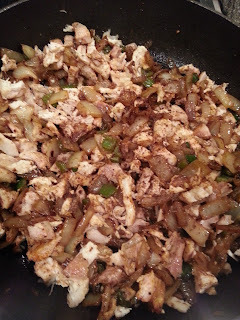 I saute it with eggs and whatever leftovers we have for breakfast, and it's often a dinner side as well. 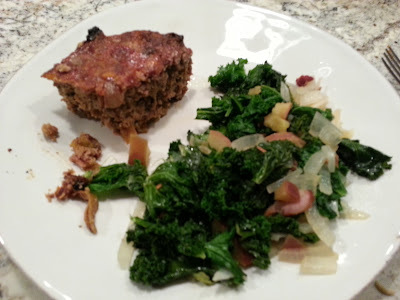 To accompany the awesome Bacon Sweet Potato Meatloaf I made, I wanted to make the kale a little different - here's what I came up with. 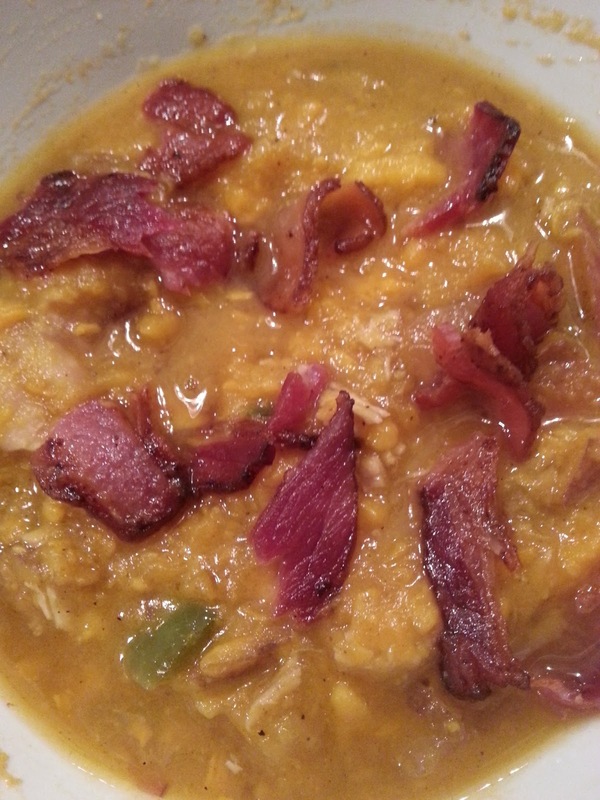 Brown onion and apple in bacon fat in skillet. 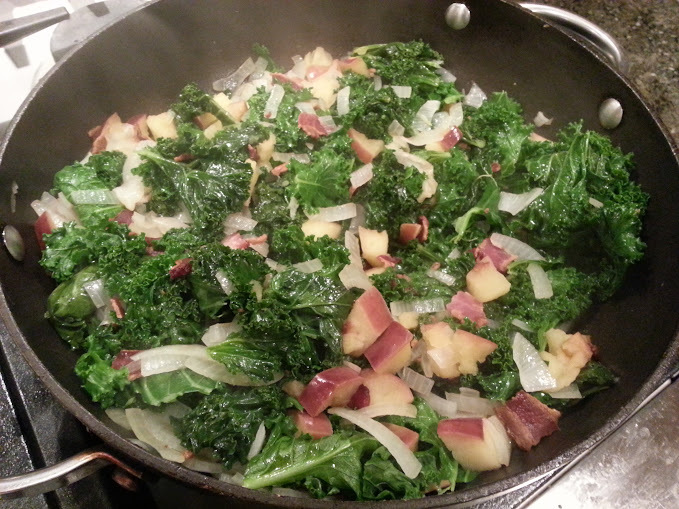 Add cider vinegar and then add kale, a large handful at a time, stirring frequently to wilt the kale. I added a little water to help the steaming. Once mostly wilted, add your bacon. 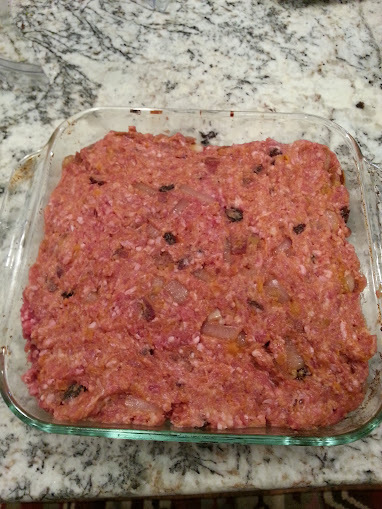 I wanted to make a meatloaf and of course was searching around for paleo-frienly recipes. I love PaleOMG - she has awesome recipes. 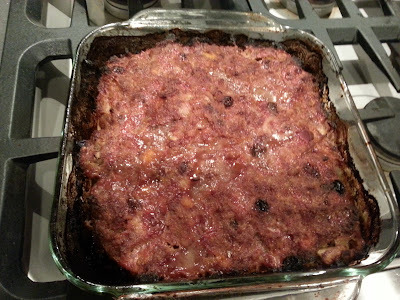 And why not put sweet potato into a meatloaf? 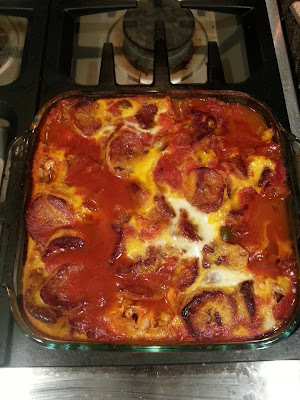 This came out awesome and I pretty much followed the original recipe, for once. Will definitely make again. Below is with my changes. Add mixture to a large bowl along with the meat. Add eggs and seasonings and almond flour to a good consistency (I didn't really measure). For me, the purpose of a Kitchen Aid Stand Mixer is to mix meatloaf. Mix all together and place loaf in a pan. This was too big for a loaf pan so I used a 9x9 ish pyrex. Bake at 400 for 45 minutes. Enjoy! Not the prettiest finished product picture but it was damn good. 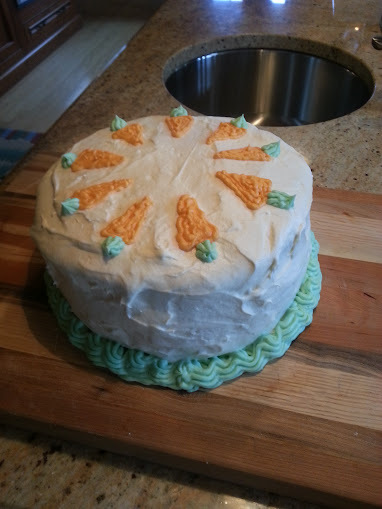 For Easter I wanted to make something special and delicious and non-paleo friendly. Rule breaker! 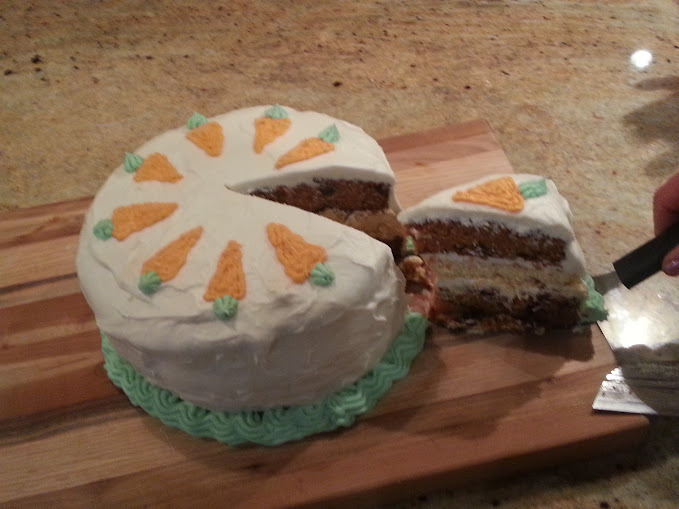 I saw a recipe from Beantown Baker for Carrot Cake & Cheesecake and loved the idea - two of our favorites! Beat the cream cheese on low speed for 1 minute until smooth and free of any lumps. Add the eggs, 1 at a time, and continue to beat slowly until combined. Gradually add sugar and beat until creamy. Add sour cream, lemon zest, and vanilla. Mix well but don't overmix. 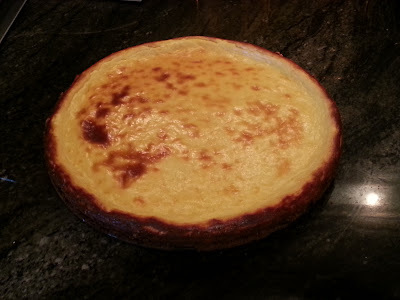 Pour the cheesecake into a springform pan with parchment paper on the bottom (cut to fit). 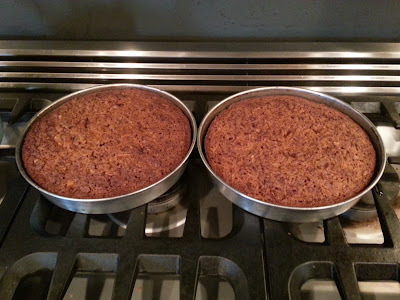 I skipped the water bath because I haven't had success with them and the cake will be layered anyway. Bake for 45 minutes and let cool completely. Chill in the refrigerator overnight. Stir together flour, baking soda, salt and cinnamon in large bowl. Beat eggs, sugar, oil, buttermilk, and vanilla with an electric mixer until smooth. Add flour mixture, beating at low speed until blended. Fold in carrot and walnuts. Pour batter into prepared cakepans. Bake at 350° about 30 minutes until done and cool completely. I then wrapped them all up and refrigerated until the next day. 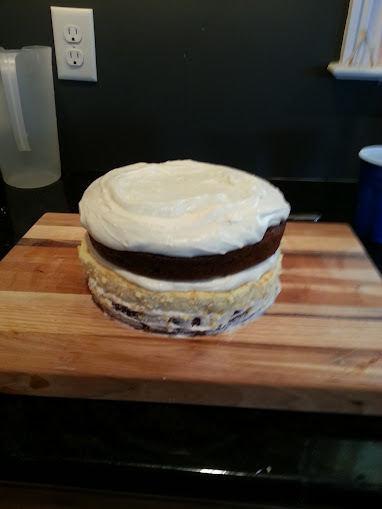 When ready to assemble, prepare cream cheese frosting. Beat cream cheese on medium-high until completely smooth, 3-4 minutes. Add the butter and continue to cream until fluffy. Add vanilla extract. Slowly add powdered sugar until desired consistency is reached. So good! 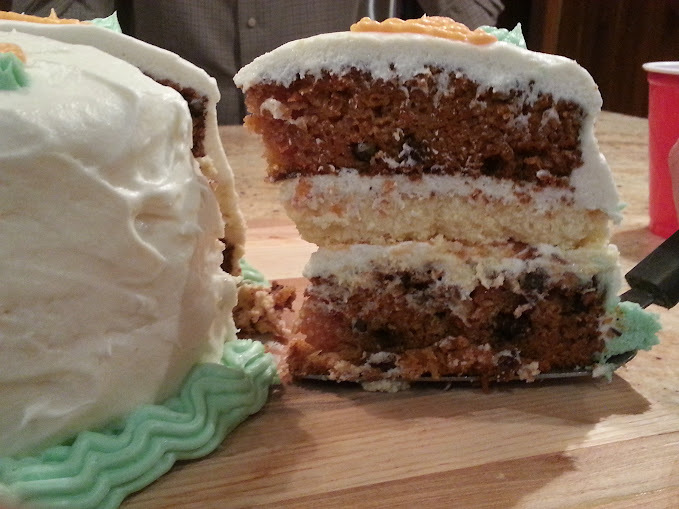 Both the cheesecake and the carrot cake recipes were awesome and I would definitely use them (separately or together) again. 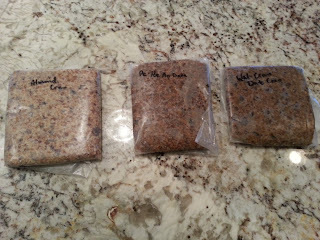 When you make these, you might as well make more than one because it's a pain to clean your food processor after! 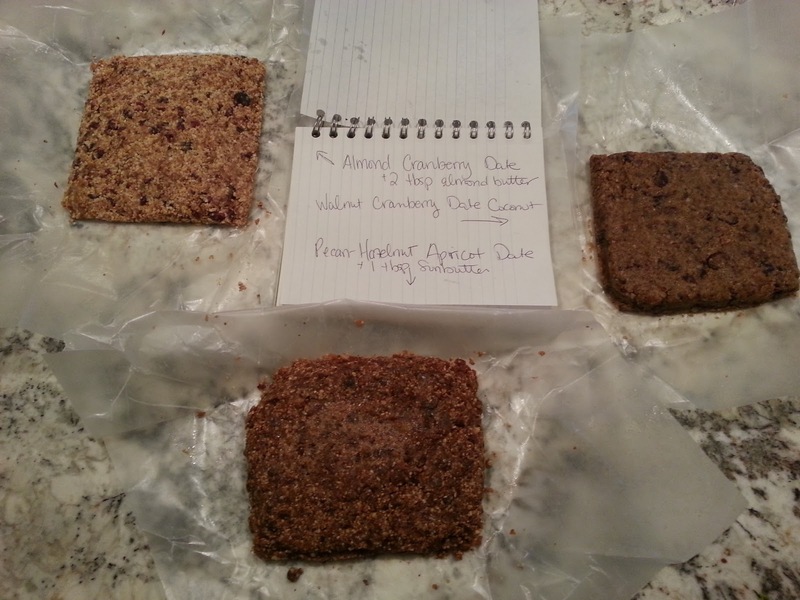 There are tons of recipes for different kinds - basically you need approximately 1c nuts : 3/4-1c dates : 3/4-1 c dried fruit. I then wrapped them up and refrigerated for about 20 minutes to harden a bit, then cut into individual bars/ or roll into balls/ however you like. I used this recipe as a guide, but made a bunch of changes as listed below. This is Chris' new favorite meal!! First, saute the onions and artichokes with olive oil to brown. 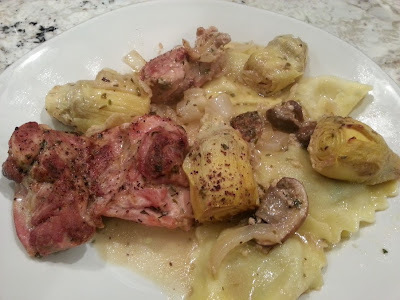 Rotate artichokes frequently to brown each side..when almost all browned, add mushrooms, some mustard, white wine, tarragon, pepper, and stock. 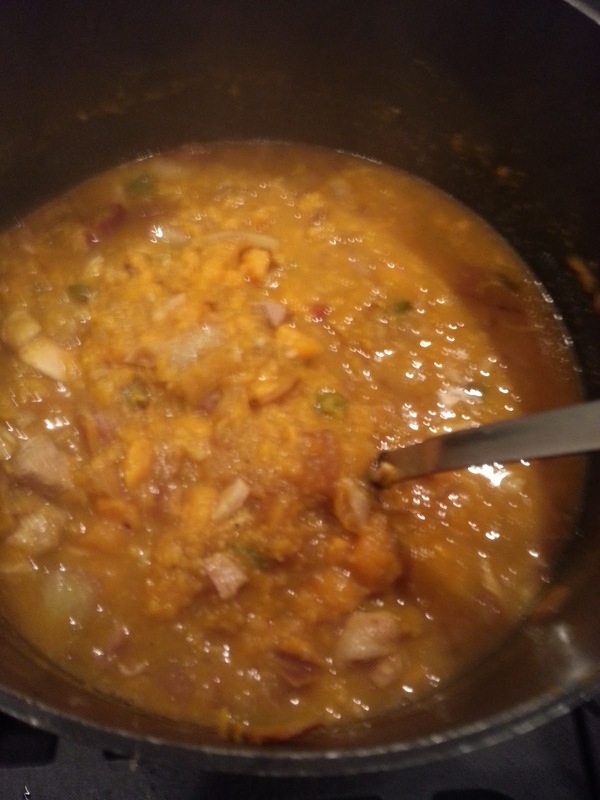 Once cooked and blended, place in baking dish. 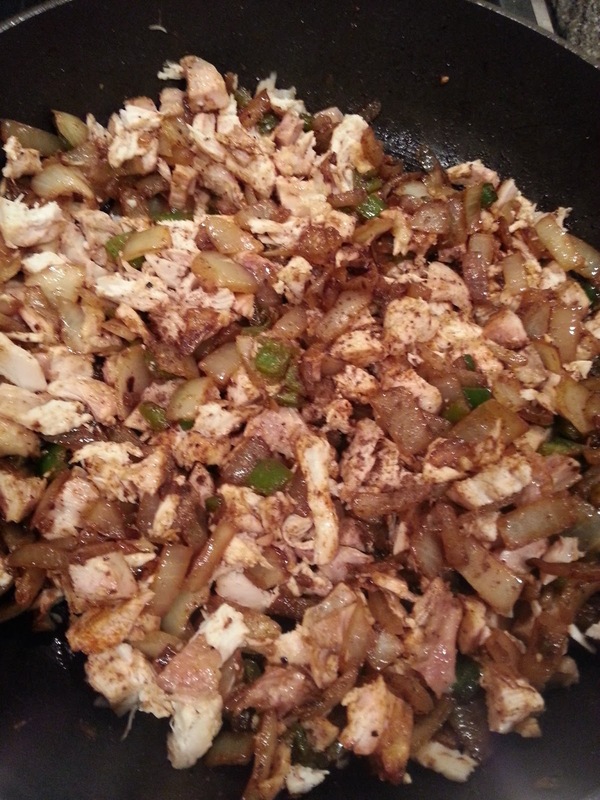 Add chicken to saute pan and brown each side. Once browned, add some more mustard, vinegar, wine, stock, and spices. Mix all and cook for a few minutes. 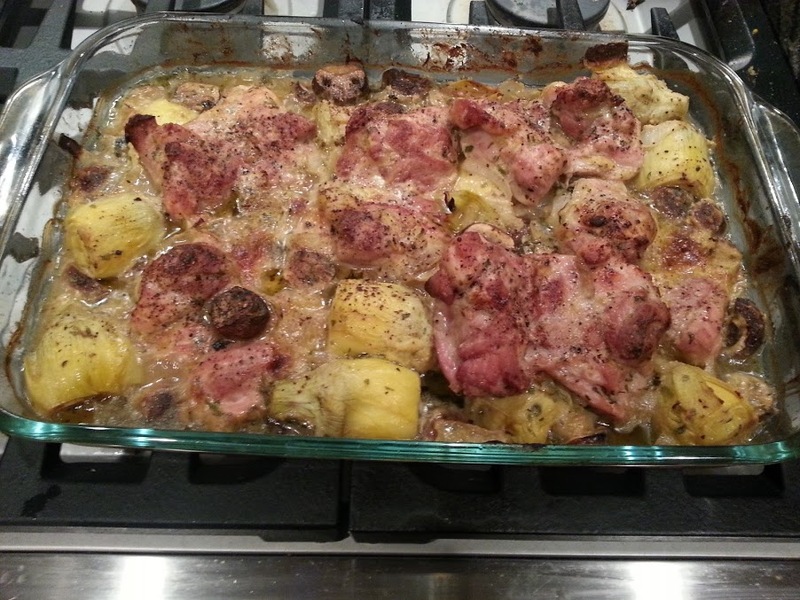 Then add to baking dish and bake for ~30 minutes or until your chicken is well cooked through. 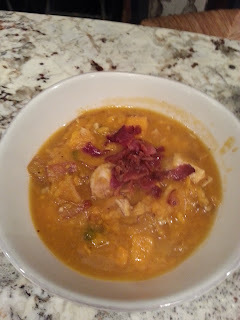 I pinned a page about a jalapeno sweet potato soup, but unfortunately it didn't share the recipe :( I found this recipe for sweet potato soup with bacon and combined the concepts to make my own delicious soup! Chop the potatoes into 1" - ish size pieces and put in water/stock and boil. Stir every few minutes while prepping the rest. Cook the bacon, then reserve most of the fat in a container (to cook your eggs with in the AM), and leave some in the pan to cook the veggies. Saute the onion & jalapenos. I did not deseed or devein them because we like it hot! Chop up your chicken into bite-size pieces. The original recipe called to puree the sweet potatoes, but we like soups like this more chunky. And it's easier. So as the potatoes start to get mushy, use a spatula or wooden spoon to smush them up. 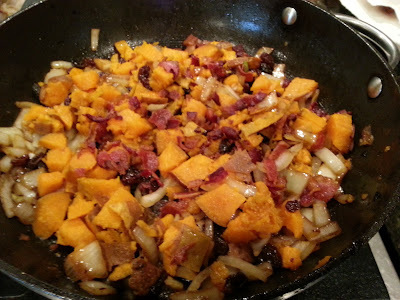 Once they are mushed to your desired softness, add the rest of the ingredients to the potatoes. I bought the plantains over a week ago - the store only had green ones so I had to wait until they got nice and dark as indicated in the recipe. In a large frying pan, brown the ground beef. Set beef aside once done. Meanwhile in another pan, heat coconut oil. Peel plantains and cut into bite size slices and saute until browned, flip to brown both sides. Add tomatoes to the veggies and warm, then stir beef in. Put the beef/ veggie mixture in 9x9 glass baking pan, top with plantain slices (I kind of pushed them into the sauce). In a little bowl, beat the eggs. Pour them over the casserole. Bake the casserole for 20 to 30 minutes. My husband and I live in an 1851 stone farmhouse in rural NJ, a property that we share with our 2 rescue mutts, 2 donkeys, 2 dwarf goats, and chickens. We look forward to sharing our adventures renovating the property and bringing it back to its true farm roots on this blog. I also love cooking, healthy living, and margaritas on the rocks! Ha.